This summer I was inspired by the The Best Christian Book of All Time Tournament to pick up a few classic Christian books that I had yet to read. One of those was On Loving God by St. Bernard of Clairvaux. While there are many books in the tournament that I have on my list to read, like City of God by St. Augustine and The Cost of Discipleship by Dietrich Bonhoeffer, I selected On Loving God because it is broken up into fourteen short chapters, one to four pages a piece, making a nice supplemental morning devotional on a two-week vacation with the family. Each day I considered one of St. Bernard’s thoughts on loving God and was able to ruminate on it throughout the day. Overall I really enjoyed this classic Christian work and here is why. This work is rooted in the Gospel. On page one of St. Bernard’s work he sets out the reason why we should love God; because He is God and He first loved us in the person of Christ, citing 1 John 4.19. God’s love is demonstrated in the sending of His son for our salvation (John 3:16). He goes so far as to call this “the claim” God has upon mankind. And I could not agree more. God is our God by right of His creation of us. He is set supreme over us by the nature of our relationship, Creator and created. This claim is only enhanced by the fact that we rebelled against Him and even in our sin He set forth a plan to rescue us through the death and resurrection of Christ, paying our very debt. By the nature of His position as God and His righteous work on the cross love for God is demanded of mankind. I also love St. Bernard’s forward lean towards our future Hope of resurrection and eternal life. In this old work, the classic Christian hope of resurrection, perfection, and life with God is revived. Modern Christianity often times tries to place our hope in the possibility of good life now but the classic and Biblical Christian hope looks forward to the future when God returns and rescues us from our bodies of death and we live with Him forever in the new heavens and new earth. Finally and most intriguingly, St. Bernard put into words something I have long considered about the Christian life. He aptly describes our progress in our love for God in four degrees. The first degree is “wherein man loves God for self’s sake” (17). Here man is initially drawn to God out of selfish interest. He sees in God salvation for His soul and blessing ever after and so is drawn into a love for God. God uses our very desires for self-preservation to draw us into Himself and then shows us something much better. When I think of my own salvation this seems to describe the situation well. I began to love God because I wanted out of Hell. I recognized myself as a sinner and saw the salvation offered through Christ and the Gospel and I accepted. But God didn’t leave me there. St. Bernard describes the second degree of love for God coming out of our experience with Him. He says that our “frequent troubles [in this life] drive us to frequent supplications” and we then begin to love God not out of a necessity for salvation, “but because we have tasted and seen how gracious the Lord is” (19). The third degree of love St. Bernard describes closely follows and flows from our walk with God in Christ throughout our life. The third degree “is to love God on His own account, solely because he is God” (19). This is progression in love again parallels my own experience in salvation and I hope yours. We come to Christ out of a desire to assuage the wrath of God that is upon us for our sins and then we begin to taste and see that the Lord is who He says He is and that He is good. As He sustains us, our experiences with Him begin to move us to a place where we understand better who He is and we begin to love Him solely because we recognize Him as God in our life and over all. It is therefore impossible to offer up all our being to God, to yearn altogether for His face, so long as we must accommodate our purposes and aspirations to these fragile, sickly bodies of ours. Wherefore the soul may hope to possess the fourth degree of love, or rather to be possessed by it, only when it has been clothed upon with that spiritual and immortal body, which will be perfect, peaceful, lovely, and in everything wholly subjected to the spirit. And to this degree no human effort can attain: it is in God’s power to give to whom He wills (21-22). If you are looking for a fun two week devotional with thought provoking ideas about loving God, I highly recommend On Loving God. Some readers may find moments of unique medieval theology, and maybe even a little dualism that may be distasteful, but on the whole St. Bernard of Clairvaux’s work is a great meditation on the love God has for man and the love demanded of man for God. Let us press on, look forward to, and seek the fourth degree of love when we are made whole. 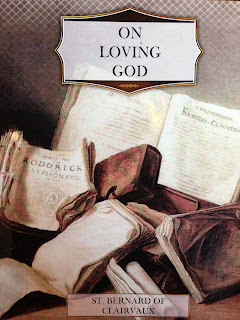 St. Bernard of Clairvaux, On Loving God. CreateSpace Independent Publishing Platform, 2012. 40pp. $6.99.